Tarun K. Saint’s 2019 The Gollancz Book of South Asian Science Fiction delivers precisely what it promises on the cover1. This anthology is 375 pages long. It offers twenty-eight stories, plus a foreword by Manjula Padmanabhan, as well as an introduction by Tarun K. Saint. Weight and wordage place this book above my entirely arbitrary limit for discussing each story individually. What you’ll get here: the bird’s eye view. Saint’s introduction provides a nearly thirty-page history of South Asian SF. It’s a well-written, tantalizing glimpse of a field new to this reviewer. Enough works are covered that I now have a reading list. Tarun, if you want to revisit the subject matter at greater length, I would cheerfully read the result. The anthology as a whole includes stories translated from Bengali, Hindi, and Urdu, as well as a multitude of stories written in English (which is why this is slotted in my WFC project and not my translation project). Actually, that’s fewer languages than there could have been. India alone (not to mention Pakistan and Bangladesh) is home to two and a half dozen languages spoken by more than a million people and over ten dozen spoken by more than ten thousand people. Bring it on, I say. ● A number of the stories end quite abruptly. This was common enough that I suspect it must be a story-telling convention with which I am unfamiliar. As well, one or two (“Why The War Ended” in particular) are less stories and more the framework around which a story could be constructed. ● I wish I had a better idea of when the individual stories were published. ● On the subject of unfamiliar: this is The Gollancz Book of South Asian Science Fiction, not The Gollancz Book of South Asian Science Fiction With Footnotes and Diagrams Explaining Various Commonly Understood Terms to Cossetted Foreigners. Just as books set in Canada rarely feel the need to explain what a 4012 is or expound on the eldritch nature of poutine. Google may be your friend in this matter. ● One gets the sense from a number of stories that frictionless efficiency is not always a feature in daily life. A few stories, like “Reunion,” deal directly with human costs of corruption. Others confront thoughtless conservatism, the needless suffering caused by a refusal to adapt to change. Some of the stories, like “Inspector Matadeen on the Moon,” skewer human absurdity for comic effect. Other stories, like “Flexi-Time,” celebrate odd coping skills, offering the suggestion that the people of South Asia have been forced to be inventive and adaptable in ways unnecessary in more tightly regulated societies. ● I enjoyed the collection. Recommended. 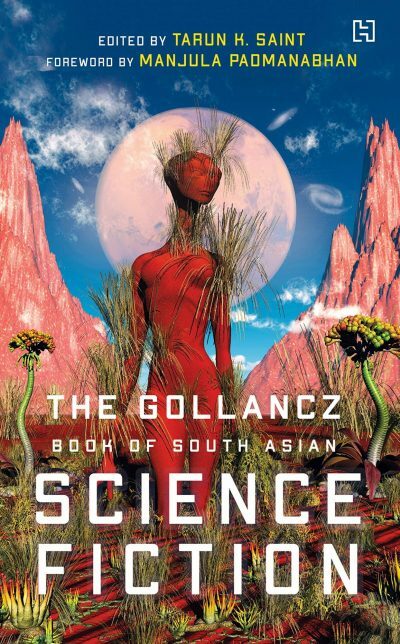 The Gollancz Book of South Asian Science Fiction is available here (Amazon), and here (Amazon.ca). If it is available from Chapters-Indigo, that fact was successfully concealed from me. 1: As is so often the case, the publisher was kind enough to supply me with a copy. In this case, it was a physical copy, packaged more securely than Koschei the Undying’s soul. If I ever have to hide my soul away from pesky adventurers, never mind the duck’s eggs; I am getting Hachette India to manage the challenge. 2: A well-known parking lot.